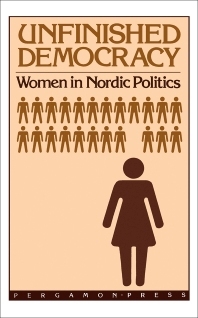 This book contains a thorough and detailed comparison of the five Nordic political systems, including the role played by women. It is based on empirical data for the last hundred years which is interpreted with regard to political and social science theories. The results of this study show that the political participation by women has increased rapidly, especially during the last fifteen years. For feminists, sociologists, psychologists, and educationalists. Introduction, B Halsaa et al. The arena for political activity, E Haavio-Mannila & T Skard. Women's organisations in the Nordic countries, D Dahlerup et al. Mobilisation of women at elections, T Skard et al. Women in Parliament, T Skard et al. Women in local politics, S Sirkkonen et al. Women in the corporate system, H M Hernes et al. Equality: how equal?, M Eduards et al. Summary, D Dahlerup & E Haavio-Mannila. Addenda. Notes. Bibliography.